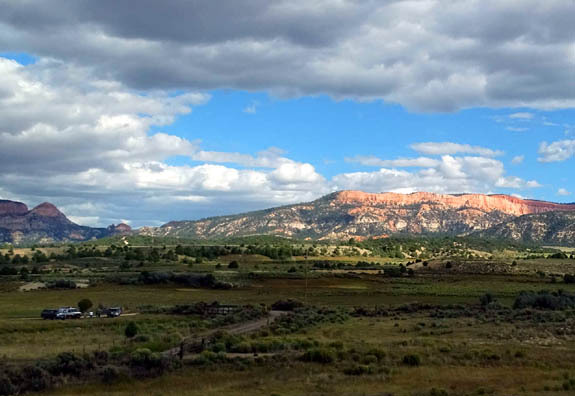 Zion National Park and Kolob Canyon." 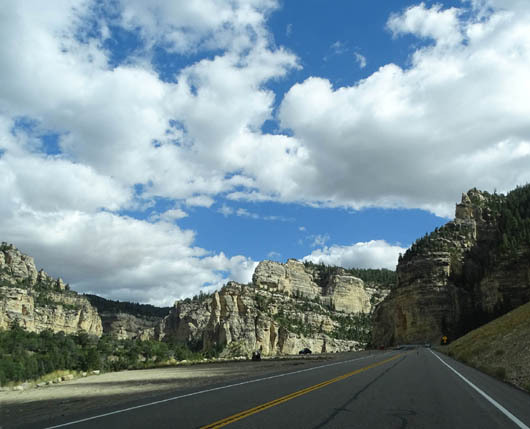 Although we didn't go on one of the Dixie National Forest Service roads for those views of Zion National Park we did pass through some great scenery on our way up and over Cedar Mountain AKA the Markagunt Plateau on this state scenic byway. 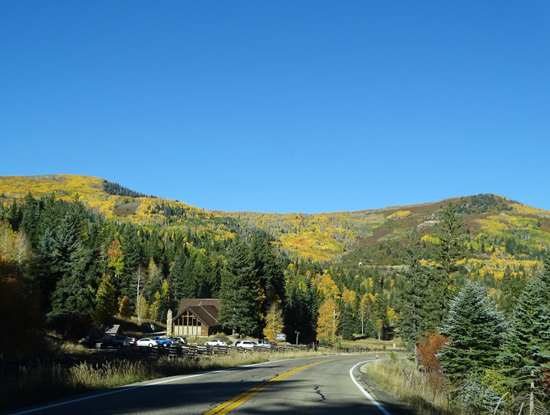 The road itself rises from about 6,000 to 10,000 feet elevation and back down again. 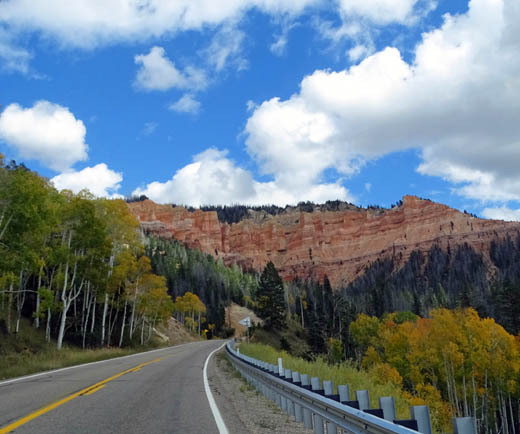 While you're up on the plateau you can get to over 11,000 feet at Cedar Breaks National Monument and Brian Head by turning off on Scenic Byway 148. I'll show photos from Cedar Breaks in the next entry. We drove all or part of Hwy. 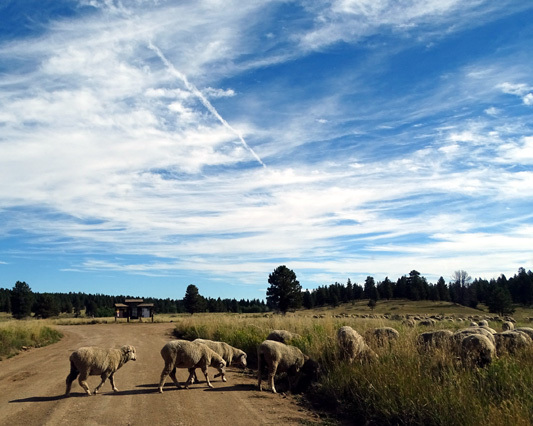 14 five times during the month we stayed at Red Canyon Village RV Park. 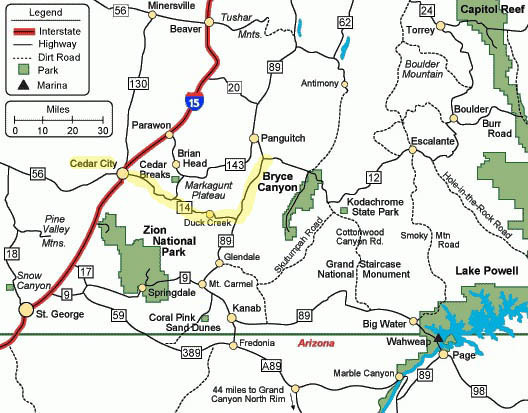 Two times were parts of scenic loops we drove that incorporated Zion National Park and Cedar Breaks National Monument. Three other times were to shop and/or get medical treatment for Cody when he had a life-threatening bout of pancreatitis (he was back to normal after staying two nights at the doggie hospital). 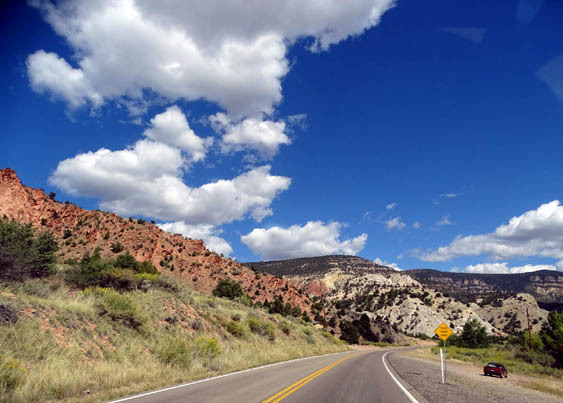 There were many recreational advantages to staying a month at Red Canyon, with its proximity to a multitude of gorgeous state and national parks, forests, and monuments. 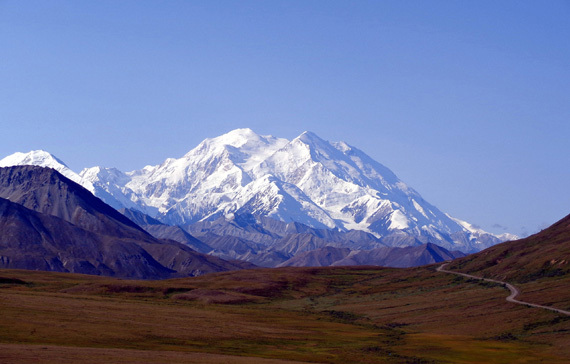 It is fairly remote for shopping and services, however. The little towns that were closer to us don't have well-stocked grocery stores or veterinarians, despite all the nearby farms and ranches with critters. 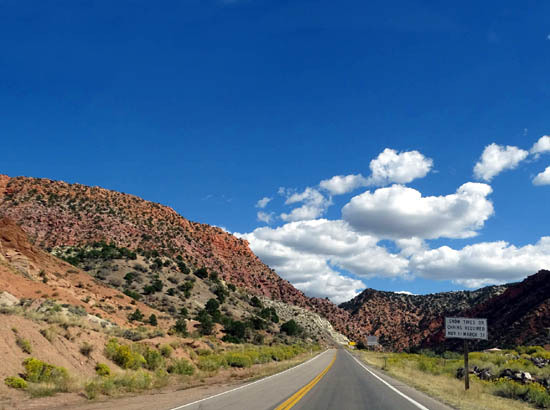 We had a lengthy drive to Cedar City, the nearest town with a Walmart, Home Depot, Lowe's, large grocery stores, and vets. As you can see on the map above, we had a choice of several routes from our campground to "Cedar," as the locals call Cedar City. 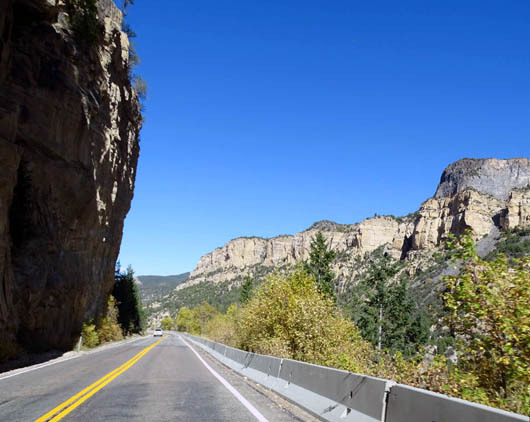 Our favorite way is a 60+-mile drive south on US 89 -- that part is fast -- then up and over the plateau on Scenic Byway 14. Because of the mountain grades and curves it usually took us about 90 minutes to drive each direction. The good thing was that it was so doggone interesting! Although we went that way a couple times during subsequent visits in 2016 we didn't go that direction during our Fall 2015 visit. 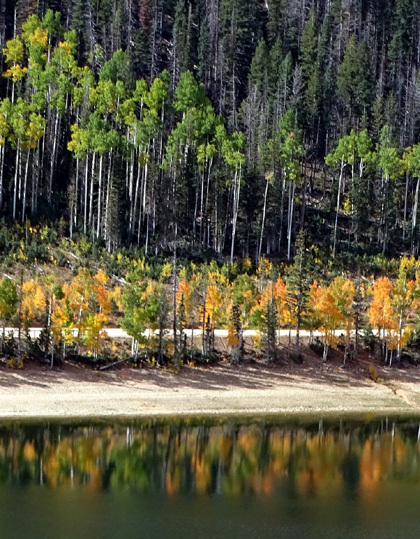 It was just too pretty, albeit slow, via Scenic Byway 14. 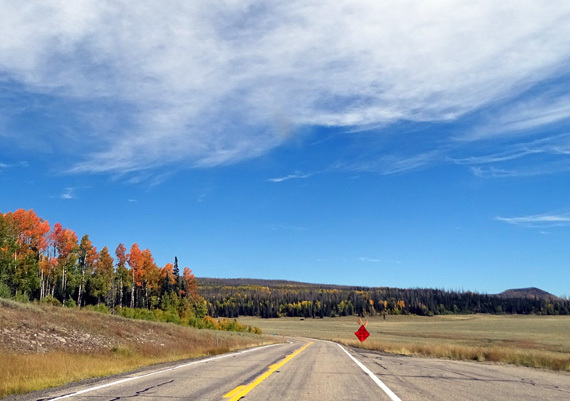 Two other slow but pretty routes incorporate Scenic Byways 143 and/or 148. 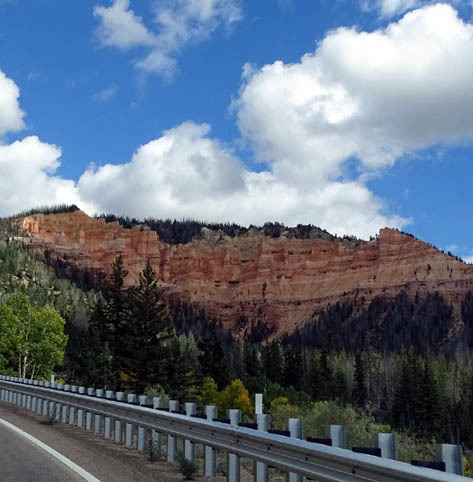 The latter is a connector that runs through Cedar Breaks National Monument between Hwy. 14 and Brian Head. 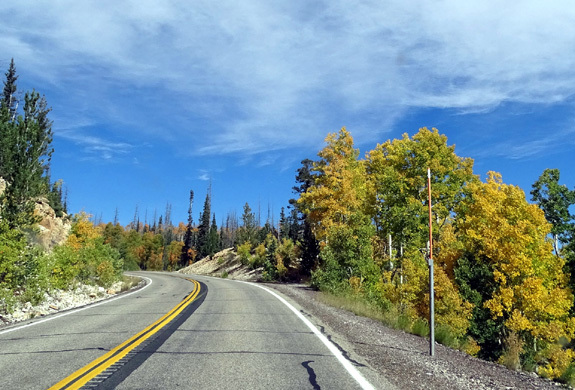 I drove, and Jim rode his bike, from Brian Head down to Panguitch this fall on Hwy. 143. 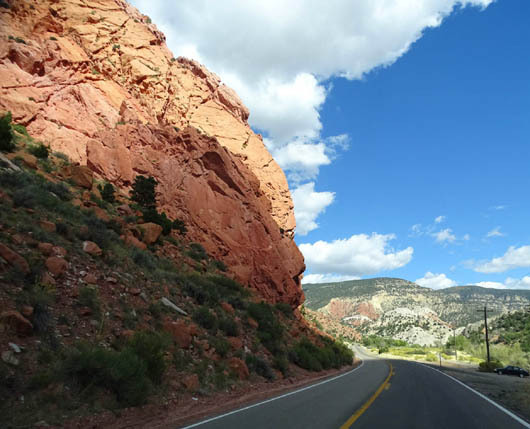 We didn't go down to Cedar City on the part of Hwy. 143 below Brian Head until the next year. 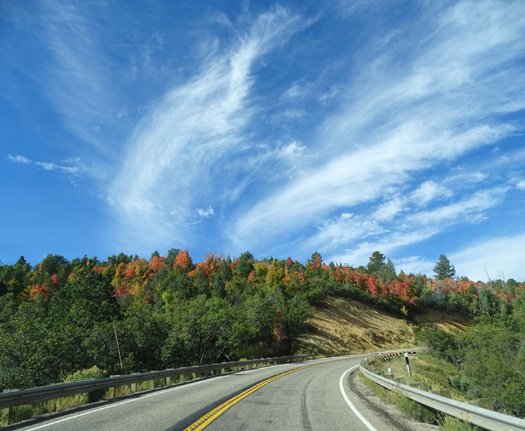 This entry shows photos from all five of our trips over the mountain plateau to or from Cedar City and/or Cedar Breaks National Monument during September and October, 2015. They are generally in order from east to west but show views in all directions. 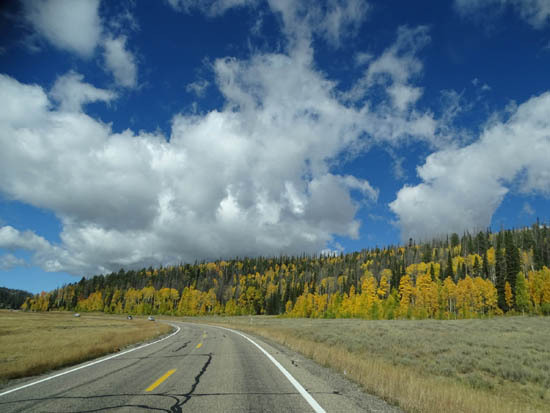 Approximately the first 30 miles of Scenic Byway 14 are in the Dixie National Forest, which has forests thick with juniper, oak, and aspen trees. Cedar Mountain is a misnomer. What early settlers thought were cedar trees are really junipers, but the name stuck. 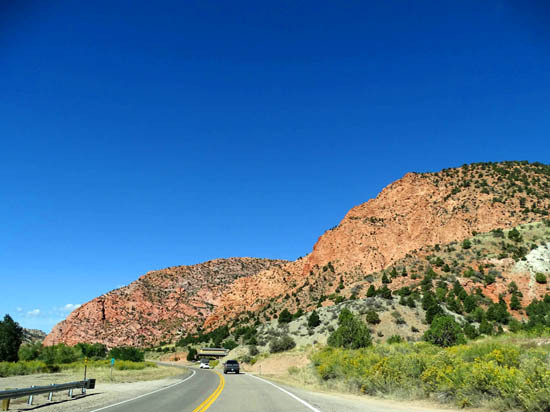 Within a few miles the road rises above the high desert terrain that is found on the Red Canyon and Cedar City sides of the plateau. 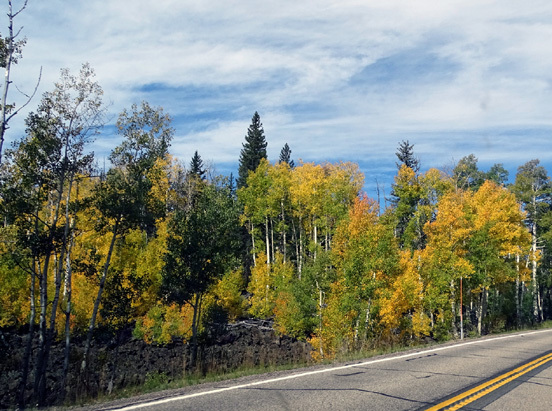 Much of the highway travels through cooler mountain habitat with lots of trees, wildlife, lakes, and streams. It feels very different than down in Red Canyon or Bryce Canyon. 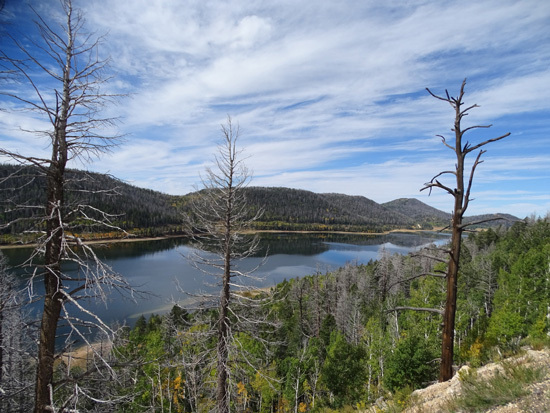 Visitors can enjoy camping, wildlife viewing, hiking, fishing, cycling, horseback riding, ATVing, photography, and other recreational activities in the national forest. According to a large, colorful National Forest brochure we picked up, some of the lava is less than 2,000 years old. Some of it came from a volcano but most welled up from cracks in the earth's surface. Underground lava tubes formed that are like caves. That's me reflected in the rear view mirror, taking pictures. We didn't see any human herders that time, but did on one of our trips across the mountain in 2016. 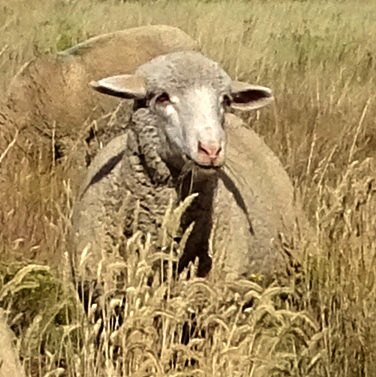 Locals have told us they've sometimes been late to work or appointments because they were delayed by stubborn sheep that took their sweet time getting out of the roadway. 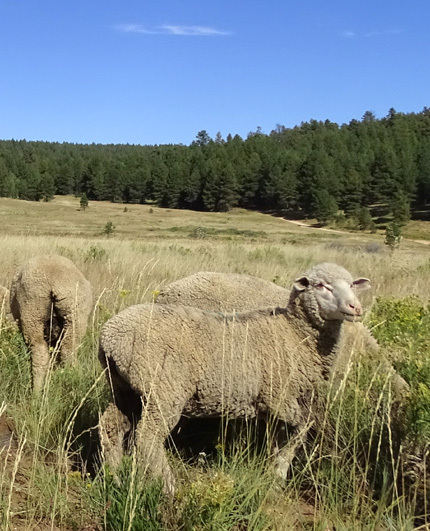 Duck Creek is a little alpine community in a beautiful setting on the plateau. There is a visitor center, campgrounds, ponds, cabins, summer homes, outfitters, and other small stores. The lake was formed when lava flowed across the eastern end of the valley in which it sits. Lava tubes run under the lake and drain water into both the Great Basin and Colorado River drainages. Visitors can boat and fish on the lake. We didn't go down to lake level until our third trip here in Autumn 2016. 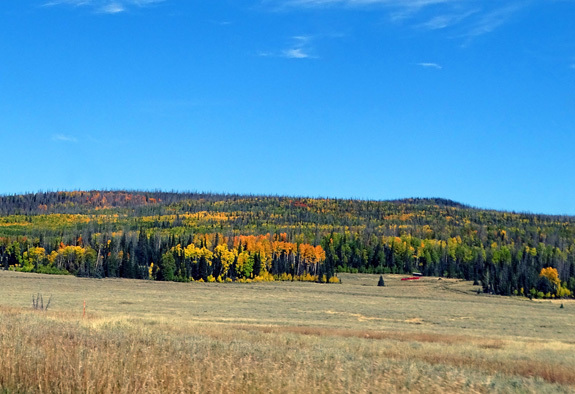 Note the snow pole on the right; Cedar Breaks had snow in early October (see pics in next entry). 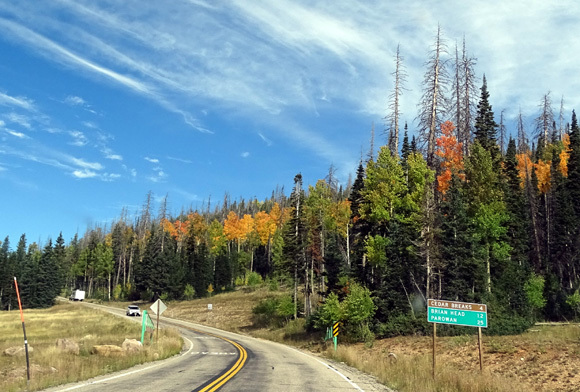 This road leads visitors a few miles to Cedar Breaks National Monument and Brian Head, which is both an alpine ski village and the highest peak on the Markagunt Plateau. Hwy. 148 is closed when it snows. 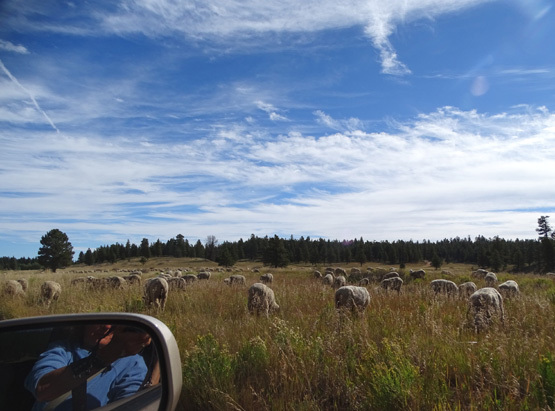 About a mile past the road to Cedar Breaks National Monument, Hwy. 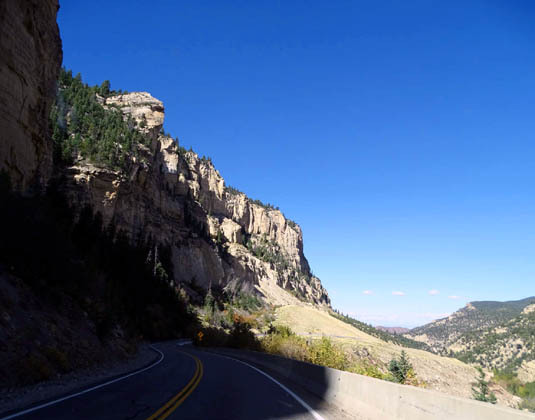 14 begins a breath-taking 4,000-foot descent over the last ten or twelve miles down to Cedar City. 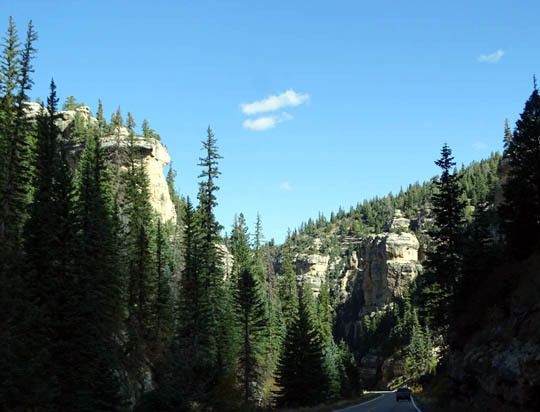 The mostly off-white rocks and green trees in those photos are similar to some of the canyons in Zion National Park. 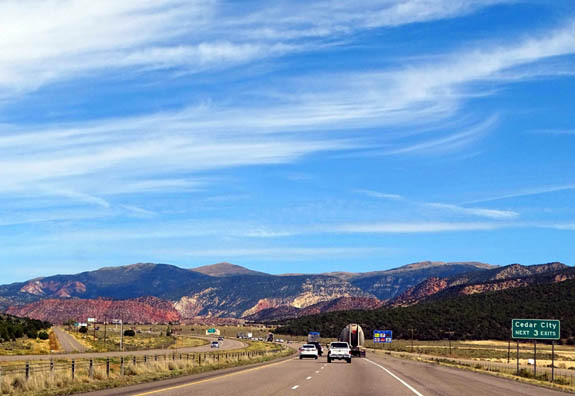 All the scenic byways in southern Utah are well worth the time and effort to drive. I'll show photos from another one in the next entry.